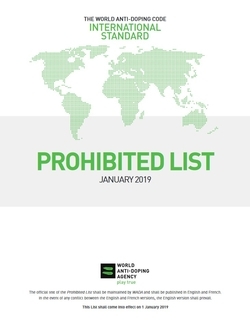 The List, which forms one of the five International Standards, identifies the substances and methods prohibited in- and out-of-competition, and in particular sports. The substances and methods on the List are classified by different categories (e.g., steroids, stimulants, gene doping). World Anti-Doping Agency (WADA) published the 2019 List of Prohibited Substances and Methods; along with, the 2019 Summary of Major Modifications and Explanatory Notes. As has been the case in past years, the List will be made available as an iPhone app and on other mobile devices effective 1 January 2019. As part of its role in providing guidance to anti-doping organisations, the World Anti-Doping Agency (WADA) publishes a global list of Athlete Support Personnel who are currently suspended from working with Athletes or other Persons under the 2015 World Anti-Doping Code’s new, ‘Prohibited Association’ (Article 2.10) rule. Current list can be opened here.